Although young peas are better, you can use mature peas here—just cook them longer. And you can use pea broth instead of chicken broth. You can serve this dish with grilled spring lamb, but it also goes well with chicken, duck, and fish. Melt the butter in a 12-inch skillet over medium-low heat. Add the scallions and cook, stirring occasionally, until they begin to soften, 2 to 3 minutes (don’t let them brown). 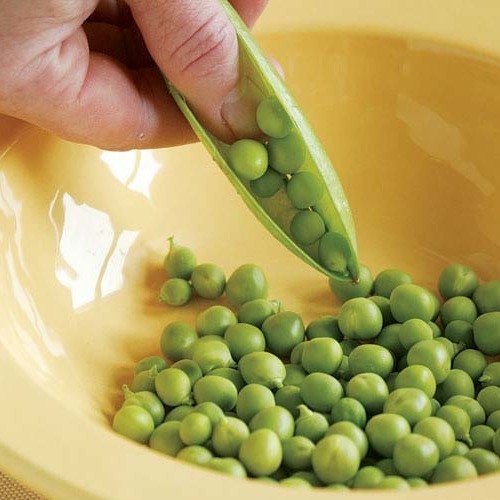 Increase the heat to medium, add the peas and lettuce and continue to cook, tossing with tongs, until the lettuce begins to wilt, 2 minutes more. Add the broth and a pinch of salt and pepper. Stir well and bring to a simmer. Reduce the heat to medium low, cover, and simmer until the peas are just tender, 5 to 8 minutes for fresh peas, 3 to 4 minutes for frozen. Remove the lid and add the mint and crème fraîche. Stir well and simmer 2 minutes more to meld the flavors. Season to taste with salt and pepper and serve. This is a beautiful side dish and really easy to prepare. 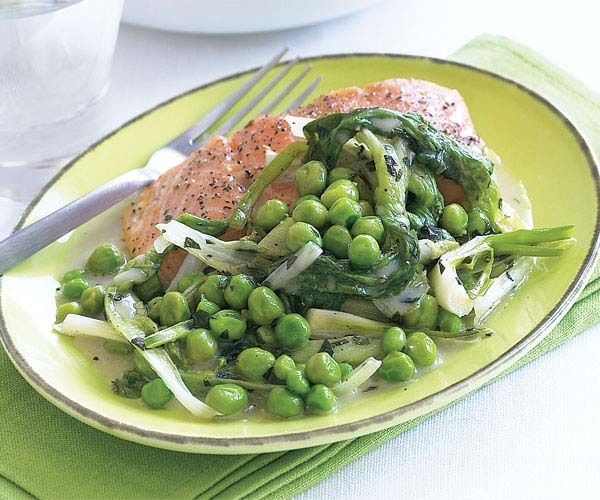 I served this with poached salmon, as pictured, and it was a light and flavorful dinner. Delicious!